Should I get a Boxster ? Who is going to check the car out? This looks to be a pretty small pre-owned dealer and I doubt they have expertise in Porsche. There is Napelton Porsche in Westmont, that is pretty close ( maybe 15 minutes or so from the car ). No affiliation just the closest Porsche dealer. Since you have a little time before you are coming out have you looked at autotrader.com? In Chicagoland we have at least 5-6 Porsche dealers and several luxury only pre-owned dealers within about a 30-60 min. drive in any direction. I've checked the poop out of Autotrader.com and found nothing for this kind of money with the mileage and options this car has. As far as having the car checked out, I'm not sure what you're talking about. I plan to go there and inspect the car myself, ensure the car has no defects, and ebay motors warrantees the car for like 3 weeks or so. I also plan to purchase an aftermarket warrantee. They have some good ones out there, so I should be ok with that. I was just curious if you wanted to go out there when I go to look. I live in Memphis TN, so the car will go to Gosset Porsche if it ever sees the inside of a dealer. My problem is I don't trust people with my cars. I know I can do a better job than most mechanics because it's my car, so I will take special car of it. ya know? Let me know of any boxsters in the Chicago area, because I'll be there anyway. Joe Rizza Porsche- 708-403-0300 They have a brand new 2004 Boxster S (silver) for sale too, plus pre-owned. Porsche Exchange- 847-266-7000 ask for Micheal (owners nephew) or Bruce (owner). I plan to go there and inspect the car myself, ensure the car has no defects, and ebay motors warrantees the car for like 3 weeks or so. I also plan to purchase an aftermarket warrantee. They have some good ones out there, so I should be ok with that. 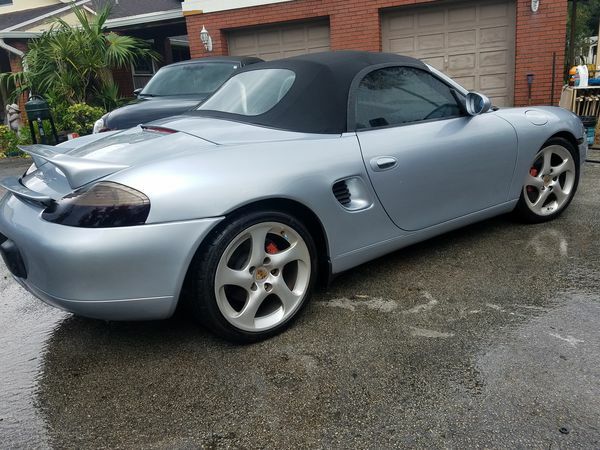 Friend, there are at least a dozen things you should be looking for on a boxster before you buy it that a typical car buyer would not look for. One example would be to see if the convertible top transmission cables are the old ones that stretch and cause a $1200 mess or have been replaced with the reinforced ones, and know what the difference is with a visual inspection. And the list goes on and on to the coolant resevoir in the rear trunk, etc. As far as aftermarket warranties go, I'm sure you can find a half dozen that will take your money, but don't count on them to actually pay you or your mechanic when something goes wrong... most find a loophole in their contract with you to deny the claim. The only one worth anything is the Porsche certified preowned warranty offered through the dealership... and you pay through the nose for that one. Best of luck to you as you buy a boxster. DO take it to a dealership and have a PPI done on the car, and DO have a 4 wheel laser alignment done on it as well before you plop down your money and sign for it. The alignment will tell you of most unrepaired frame damage, bent struts or bent control arms, etc. Don't forget that lots of people buy Boxsters, drive them like hell, and sell them when they get bored with them and don't care for them like most of us here on this list. Hope this info helps. I, like you, bought off Ebay and got a killer deal on my boxster. I was out of my mind though to think I could check out this particular car and avoid buying a car requiring lots of repairs to become dependable. $7800.00 in repairs later, the car is reliable, but is still not what I hoped it would be condition-wise. Last edited by RandallNeighbour; 10-07-2005 at 12:59 PM. MightyMouse, did you buy the Boxster in Chicago?? I believe "chopping" refers to putting your top about 1/2 way down and "karate chopping" the big wrinkle in the center of the crease in the back window so the window folds neatly. Sometimes in really hot weather this isn't necessary, but it is a good idea each time you lower the top. You can also pad your window as you put the top down to keep the plastic from sticking to itself. You can either buy a Porsche window pad for $$ or use a cheap terry cloth bath towel and achieve the same protection. After you "chop" the window, lay a towel folded in half so the towel crease lays against the window crease and continue to put the top down. Hi everybody. I’ve browsed a couple consumer reports sites, your forum, and this sticky thinking about a Boxster. I’m a Soldier, early 30s, two young kids, brand new house, and currently drive an 02 Kiata as a DD (also have a Jeep and an SUV). Love roadsters and think of the Porsche Boxster as the epitome. I’ve done a lot to improve the reliability of the Miata and could probably get about $4k for it. I found this ad on Craigslist: https://denver.craigslist.org/cto/d/2002-porsche-boxster/6244968506.html. I’m mechanically inclined, but NOT a mechanic and do not “speak German”. Also wish it was manual. I’m so tempted to trade my car for this thing, but can’t tell it it’ll be the first shovel-full in a deep hole? Not sure I am posting this correctly. will 217 HP Vs 250 HP be a significant difference? Can you handle the light speed that comes with an extreme 250 HP Boxster???? Research the differences between Base and S. There are several key upgrades that the S has but it does come at a bit more $$$. Much less than adding them to a Base afterwards. Here's the sheet on the 04S from Porsche with what is upgraded from base. This is cool one. I like this. My 2 cents for what its worth is go for an S if you can afford it. Have a Porsce Pre purchase inspection completed at a dealer. As mentioned above HP an S version has other upgrades over a base. Also I have never heard anyone say they had toomuch horse power let me reduce it. In the end you should test drive both and make your decision, and be happy with it. A boxster drives awsome, handles like no other car i have driven. Boxsters are fun and pretty easy to work on for DYI. I have a 2001 and my father has a 2000 and 2002. Yes, you should get one. Get the Boxster S. I did, main reason was I knew I would ld be wanting the 3.2, if I had gotten less. Mine is just a joy to drive. All i can say which country do you live in . Can you do your own work. I'm looking at several Porsches in PA, VA, MD and NJ - where and how can i get a Pre-purchase inspection? Cost? Also, any reco for a good independent shop around Harrisburg/Hershey/York/Carlisle PA area?